We are knowingly hiking into familiar horror terrain with this tale of bachelor party backpackers getting drawn off the beaten track and into the wilds of some nameless Norwegian wood. When a lads’ beery night out ends in violent tragedy, our group of friends decide to go on the bromantic excursion they’d been planning that night regardless. Partly in defiance, partly to pay tribute to a departed friend. But perhaps it’s time to tone down the boorish clichés of Vegas, or Ibiza, and opt for a suitably sedate, sombre walking weekend in the remotest Scandinavian wilderness. What could possibly go wrong? 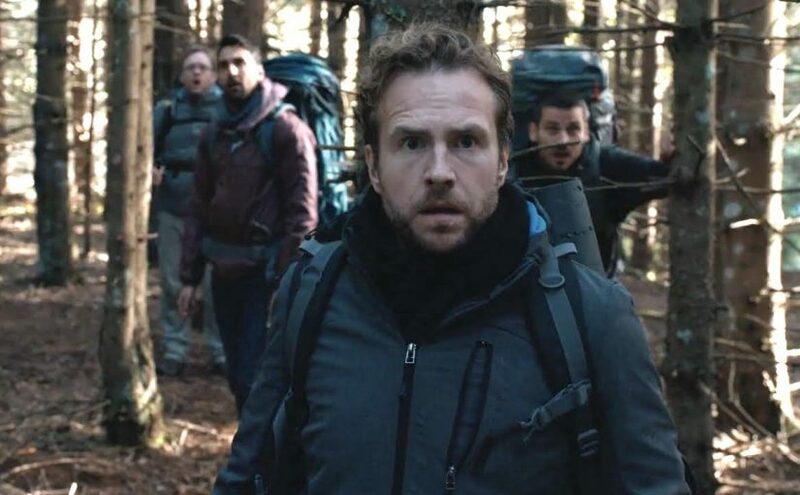 Always-genial screen presence Rafe Spall, as Luke, leads Asher Ali (of the sublime Four Lions (2010)), Robert (a long way from Downton Abbey) James-Collier, and (grandson of The Second Doctor) Sam Troughton on their Arctic Circle odyssey. This film will sell on the promise of genuine chills, boosted by a credible cast for such a steadfast genre piece. It’s the sort of role in which Spall excels: easy-going, salt-of-the-earth, ordinary good bloke trying to overcome past trauma. As the audience, we’re happy to trek willingly into the not so great outdoors in such amiable but healthily world-weary company. Of course it doesn’t take long before things go teats-up, and an ankle sprain forces our motley crew to take a short-cut through dense and, well, utterly terrifying forest. Oh, and sheltering in some spooky deserted barn surrounded by demonic-looking carvings with the kindling bust of some pagan deity installed upstairs. But it is a blood-pumpingly unsettling scene, a good device for lancing the boil of the insecurities all four are carrying. Luke’s recurring nightmares, especially, are effectively and disturbingly raised around him. The ‘folk horror’ genre is currently resurgent as the unholy triumvirate that founded it (Witchfinder General (1968), The Wicker Man (1973) and The Blood on Satan’s Claw (1971)) ever-gain in reputation towards near-mythic status. It being a stand-alone but fuzzy category based on a tiny number of disparate works, it’s almost like the current renaissance is seen as a chance to retrospectively bolster its numbers. Recent historical hocus pocus The Witch (2015) is probably the most successful new entry to the canon. Both that film and this share the slow pulling of the audience into the trees with each slow camera pan. But this contemporary-set, more mainstream set of jump scares won’t manage the same potent lure over the viewer. Yet, while we might know what to expect, its delivery is comfortably above standard. We’re on an enjoyably fraught journey as our troop’s shared ordeal deepens, and their thready relationships are frayed to snapping point. As it becomes clear there definitely is …something out there, it’s most effective when that presence is merely implied. The third act’s need to deliver on that threat is where the creaks and cracks in the grain start to show. The earthly ingredients of The Blair Witch Project (1999) and The Wicker Man are bolted on, to the point where the wood starts to feel a little like a hollowed out tribute. The Ritual might offer ritual frights, but in a superior package for a ‘don’t go down to the woods today’ yarn. It’s ultimately let down be being forced to show its hand, with a shoe-horning in of folk horror’s constituent parts, in an effort to nail some of that seductive, but oh-so elusive, dark magick to the tree.